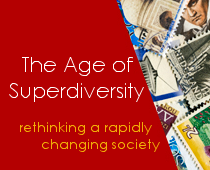 Can the fabric of a diverse society be undone? If you woke up this morning in a British city, you can see this happening right in front to your eyes. From the Conservative Party Conference in Birmingham – one of the most diverse cities in the UK – the Tories are feeding the press with anti-immigration soundbites relentlessly, competing among each other for who upsets the liberal Guardian readers the most. Nearly all major newspapers open their front pages this morning on immigration, often with direct quotes of their favourite minister. The message is clear, this government will give to the people (or more precisely the British voters) what they want and ‘we must not ignore the fact that people want to talk about immigration’ explains Amber Rudd. And if you are ‘a foreigner’ (the definition these days is rather flexible and for some includes also BME), you are likely to be asking yourself: do I really have to stay here? Unfortunately, disentangling oneself from a place is not as easy as asking the question. ‘Cutting immigration’ has become the new mantra of British political life, the tune everyone in politics and media has to dance to. It looks as if nothing else count these days and everything is framed through the prism of controlling immigration. This happened to be a malleable and multitasking tool in the hand of our politicians – an incredibly bright spotlight that leaves them immense policy opportunities in the darkness, away from public scrutiny. At the beginning of the week, the Daily Mail launched a vicious (and unsubstantiated) attack from its front page on EU doctors working in the NHS for allegedly posing a threat to UK patients, a few days later the PM and the Health Secretary have ready a proposal to train more British doctors. Yes, the same Jeremy Hunt who has upset the majority of British doctors. No, don’t expect the Daily Mail to appreciate the irony. This is the newspaper who strangely enough never castigated Theresa May for failing her own immigration target for five years as Home Secretary. Liam Fox instead has talked of EU nationals currently living in the UK as bargaining chip in the Brexit negotiations. Amber Rudd wants firms to publish a list of foreign workers and to name-and-shame those firms who employ too many foreigners and, if this was not enough, she also wants to restrict access to international students, who are the ambassadors for Britain and its HE system in the world (they also bring a lot of money but I leave this argument to Universities UK). Many this morning felt a sense of shock. Journalists have queried Theresa May expecting some kind of reassurance or clarification. And she responded reassuring EU workers living in the UK that they are welcome… for now, that is until they can be disposed and replaced by the new breed of Brits. Literally cutting migrants is how this new ‘centre ground’ of British politics is translated on the street, with verbal and physical abuses against foreigners at unprecedented level. But this is Brexit Britain and Tory politicians keen to launch a hostile takeover bid on UKIP and its voters are unwilling to speak out. And others follow suit. According to the European Commission against Racism and Intolerance (ECRI), police, prosecutors and the courts are “filtering out” racial elements in hate crime cases, half of reported hate crime is not prosecuted and judges are underusing heavier sentences for hate crime. So, the short answer is: unfortunately, yes.